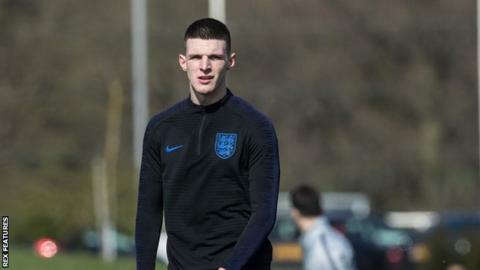 Declan Rice has apologised after a social media post emerged in which he made an apparent reference to the IRA. The England and West Ham midfielder, 20, was an Ireland youth player in 2015 when he wrote '#UPTHERA' on Instagram. Rice, who recently earned his first call-up to the England squad, apologised for "any offence caused" by the "poorly expressed comment". "I recognise my attempt to show support for my team-mates at the time could be negatively interpreted," he said. Rice won three senior Republic of Ireland caps, all in friendlies, having played for his grandparents' country since under-16 level. He transferred his allegiance to England last month. England manager Gareth Southgate, speaking at news conference on Thursday before England's Euro 2020 qualifier against Czech Republic on Friday, said: "He's apologised. It's not representative of what he believes and what he feels. Outside of that it was when he was 15 or 16 and engaged in conversation with friends. The Football Association said it was aware of the post and will be writing to him "to remind him of his responsibilities".